Barnes & Noble has announced a new Android tablet. Dubbed Nook Tablet 7", it's a 7-inch entry-level device that's powered by a quad-core processor and sports a display resolution of 1024 x 600 pixels. While the amount of RAM isn't known, the device has 8GB internal memory (expandable up to 128GB). In terms of camera, the tablet sports a 5MP rear unit and a 2MP front shooter. No word on the battery capacity as well, although the company claims the device offers up to 7 hours of reading, watching videos and web browsing. Connectivity options include Bluetooth, dual-band WiFi, and microUSB. There's a 3.5mm headset jack as well. 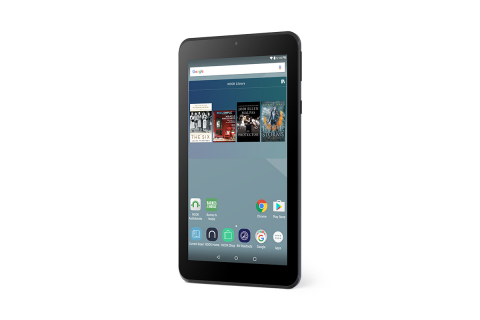 The tablet - which runs Android 6.0 Marshmallow and has full access to the Google Play Store - carries a price tag of $49.99, and will be available for purchase starting November 25. It's currently up for pre-order.